The new ARX Rallycross series was created when Red But Global Rallycross shut down. Subaru brought three 600hp WRX STI Supercars and they started right where they left off. This was the debut of the new Americas Rallycross series (ARX) that took place not in America, but at the Silverstone circuit in the UK. It looked a lot like the now defunct Red Bull Global Rallycross with the Andretti Volkswagen Beetles of Tanner Foust and Scott Speed making quick launches off the line. 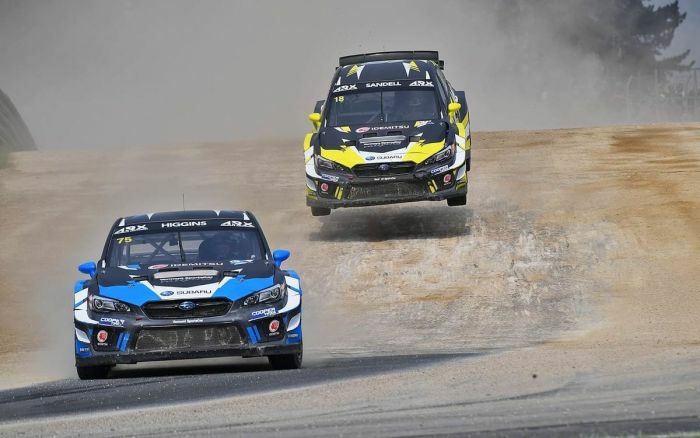 Subaru brought three WRX STI Supercars to the event driven by Chris Atkinson, Patrik Sandell and local favorite David Higgins and the results were the same as last season. On Saturday it looked promising for the Subaru WRX STI Supercars. Sandell started in pole position but was cut off going into turn one, causing a flat tire which ultimately resulted in a mechanical DNF as the tire disintegrated during the first qualifying session. In session three, the intense rallycross action returned as Chris Atkinson got caught up in traffic and clipped a barrier causing the car to roll and came to a rest back on its wheels. Atkinson’s #55 WRX STI was able to continue for the rest of the qualifying session. It was the first time back in a rallycross car in a while for David Higgins who continued to improve his pace and get more familiar with the #75 STI throughout the qualifying sessions. SRTUSA finished the day with Sandell in fourth position, Higgins in fifth, and Atkinson in sixth. Sunday was the final day of the Americas Rallycross Silverstone event in Towcester, England. The Supercars were right back with two lap practice sessions before the final qualifying round of the weekend. It looked good for the Subaru WRX STIs with Atkinson and Higgins taking first and second position respectively during their qualifying race. Taking the win in the ARX main event was no surprise, Tanner Foust in the Andretti Volkswagen Beetle took first followed by Scott Speed, the reigning GRC champ, in his VW Beetle. Liam Doran of Great Britain finished third in a Citroen DS3, and Patrick Sandell’s #18 Subaru WRX STI finished fourth. Round two of the Americas Rallycross Championship will be held at Circuit of The Americas in Austin, Texas.